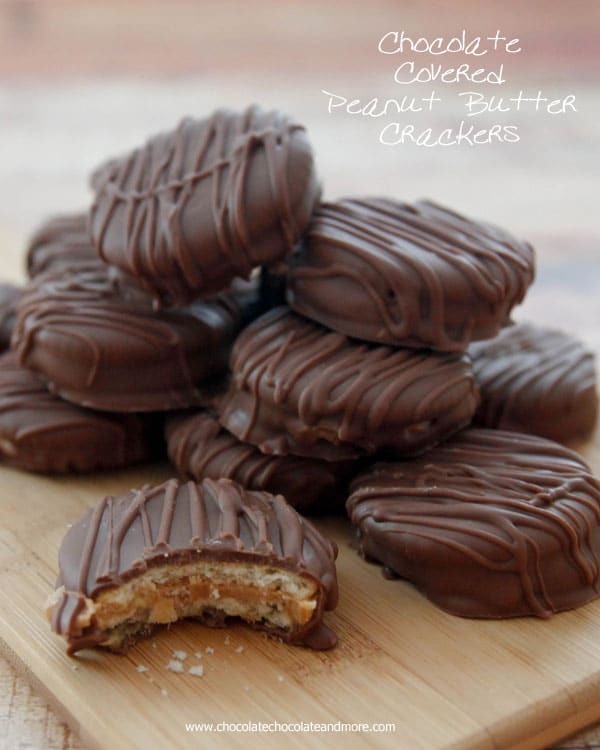 Chocolate Covered Peanut Butter Crackers - Chocolate Chocolate and More! Chocolate Covered Peanut Butter Crackers-taking your favorite snack to the next level by covering it in chocolate! I’ve always loved peanut butter crackers. As soon as I was allowed to make my own lunch for school, I quit sandwiches and took peanut butter crackers. I’d make a few extra. Either to snack on during the day or to share with a friend. Even now as an adult, I find myself grabbing the box of crackers instead of the bread when I feel my tummy start to rumble. As a treat, I’ll add some powdered sugar. Turn those crackers into a dessert. Just look at those peanut butter filled crackers. Don’t they make you want to run to the kitchen and make some up? But it gets better. Melt some chocolate. 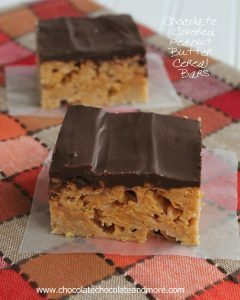 I recommend using a chocolate made for candy making like Almond bark or candy melts. It will harden back up like a candy bar and not melt all over your fingers while eating. 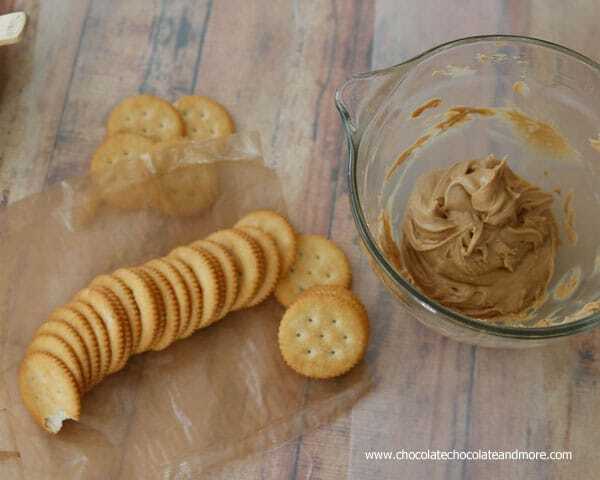 Dip your chilled cracker sandwiches in the chocolate. 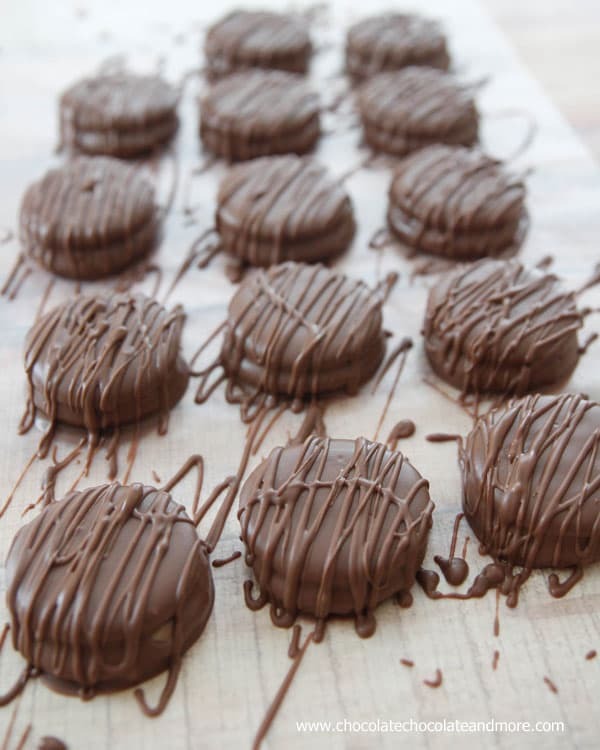 Then use the leftover chocolate and have fun drizzling it over the chocolate covered crackers. There’s no wrong way to drizzle. Do straight lines, do swirls. The key to a good drizzle is just to keep moving. 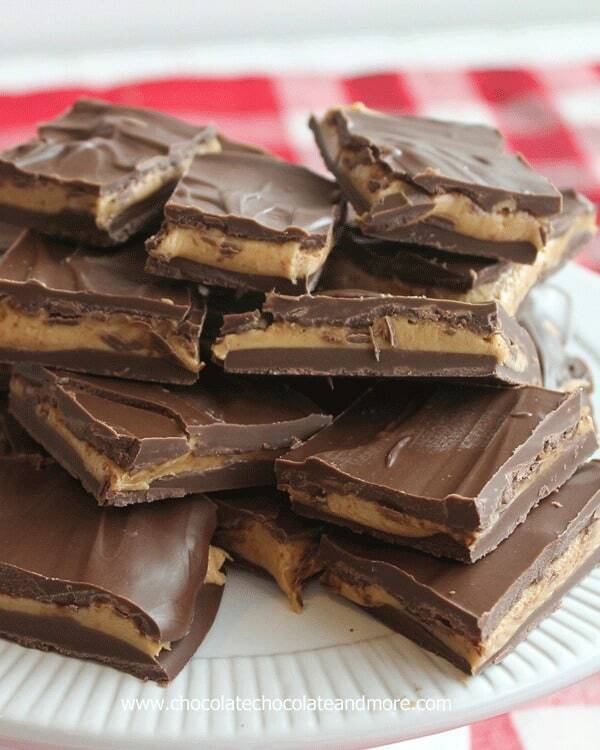 Once the chocolate sets, you’ll have gorgeous chocolate covered peanut butter sandwich crackers that will disappear before your eyes. 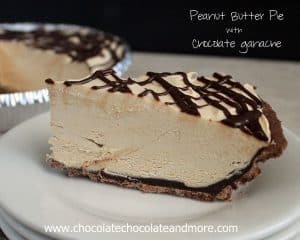 Stir powdered sugar into peanut butter until smooth. 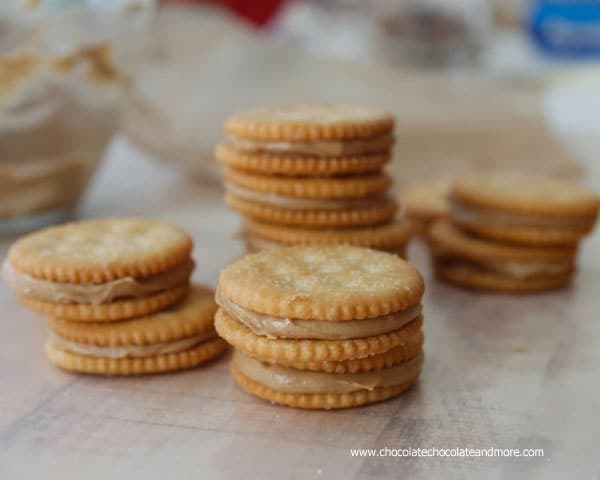 Spread a heavy teaspoonful of peanut butter mixture on one side of a cracker. Top with a second cracker to make a sandwich. Repeat with all crackers until all are used. Place prepared crackers in the refrigerator to chill for 15 minutes. 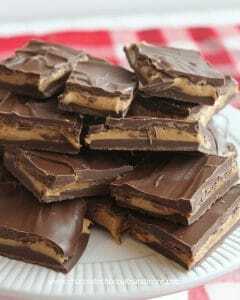 Melt chocolate almond bark or candy melts according to directions. Line a baking sheet or your counter with wax paper. Dip the bottom of one sandwich in the melted chocolate just to coat. place sandwich on a fork, chocolate side down and with a spoon, pour chocolate over top of sandwich to coat. Gently tap off excess chocolate. Place coated sandwich on wax paper to set. Repeat with remaining sandwiches until all coated. Place remaining melted chocolate in a plastic bag, squeezing chocolate to one of the bottom corners. 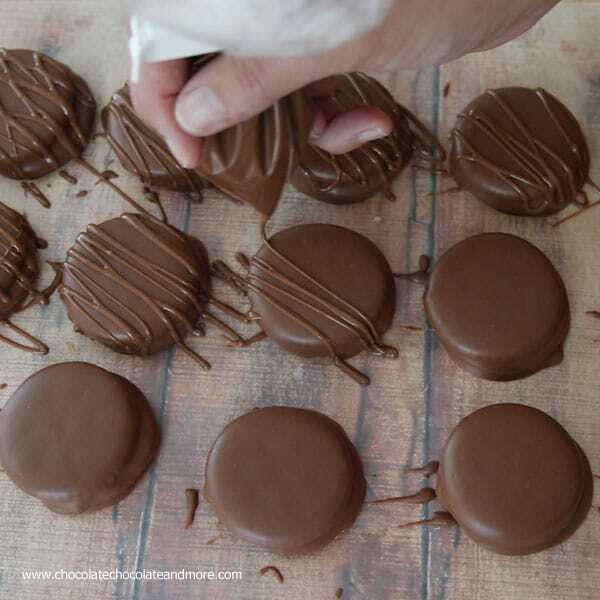 twist or close bag to seal, cut a small hole in the corner and drizzle chocolate over covered sandwiches. Let chocolate set completely before storing in an airtight container. 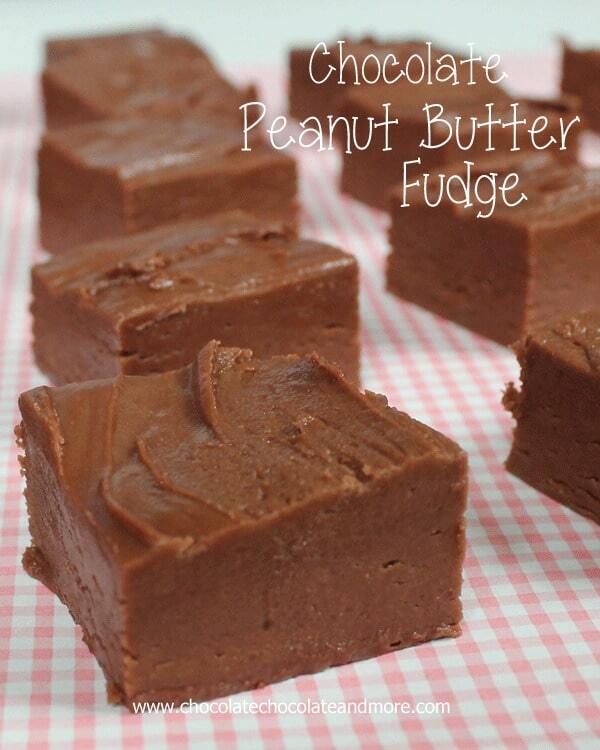 Want more peanut butter and chocolate treats? My godmother makes these and I’ve always been obsessed! This is perfection!! I need some for my next road trip this week! Thank you for the link love too! These are so fun, LOVE!!! I NEED an entire dozen of these! How yummy! P.S. I need to see you again, friend! I had so much fun hanging out with you last weekend! xo!